In this project, students will learn the photocell principles of operation, and interface with a photocell to measure resistance and translate that to light intensity. 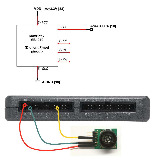 This project introduces students to the operation, interface theory, and features of an IR sensor. Students build an interface circuit and use LabVIEW and myRIO to acquire and display proximity data. This project provides students with the experience necessary to understand and discuss the relay principles of operation and the application of these principles. Students learn how to use a PD (proportional-derivative) compensator to control motor position. Designed for NI ELVIS II/II+. In this lab, students will derive inverse kinematics equations for determining the angular position of bars of a five-bar linkage given the position of an end effector. Designed for NI ELVIS II/II+. Students learn how to use a PI (proportional-integral) compensator to control motor speed. Designed for NI ELVIS II/II+.